Since the 1980's this area in the Philippines between the islands of Mindoro and the Dos Hermanas and Sibuyan Islands in Romblon province is riddled with ill-fated stories about sinking ships and other anomalies. These events claimed thousands of lives including the infamous sinking of MV Doña Paz; dubbed as Asia's Titanic. The area is sometimes compared to the Bermuda Triangle. 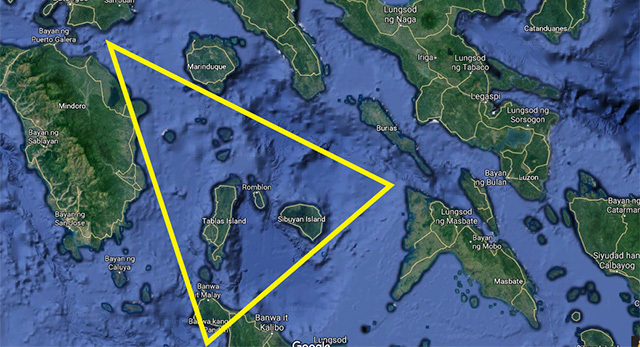 Hence, the locals call it Romblon Triangle. In this area, a golden ghost ship captained by an entity named Lolo Amang(Grandfather Amang) sails during the night around the Romblon Triangle. Alleged appearance or sighting of this ship often leads to a tragedy. “So many ships have made the Romblon Triangle their final resting place. They went down to their watery grave with thousands of people on board,” said Sibale Mayor Lemuel Cipriano. In World War II, The Romblon Triangle became a war zone during the Battle of Sibuyan Sea on October 24, 1944. The fighting between Allied and Imperial Japanese Navy claimed thousands of lives, including the sinking of Musashi, a giant battleship. The shipwreck of Musashi was rediscovered last year. The Battle of Sibuyan Sea is just a part of a largest naval battle in human history, the Battle of Leyte Gulf. The anomalies started in the 1980's. It all started in the sinking of MV Don Juan in the night of April 22, 1980. Allegedly, the captain saw a gleaming, golden ghost ship, he tried to avoid the ship which caused it to collide with a small oil tanker. The collision cost 187 lives. The same accident happened again 7 years later, in a larger and more tragic scale. 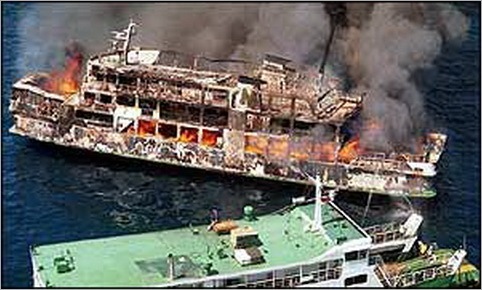 The sinking of MV Doña Paz is considered as the worst maritime accidents in Philippine history, the scale is so large that it is called Asia's Titanic. The MV Doña Paz sunk with more 4,341 people on board after colliding with an oil tanker. There is a strange coincidence here, both of MV Doña Paz and MV Don Juan sunk because of a collision with an oil tanker. Did the Captain of MV Doña Paz encounter the enigmatic golden ghost ship before colliding in the oil tanker? Why ship collisions happen in this area? 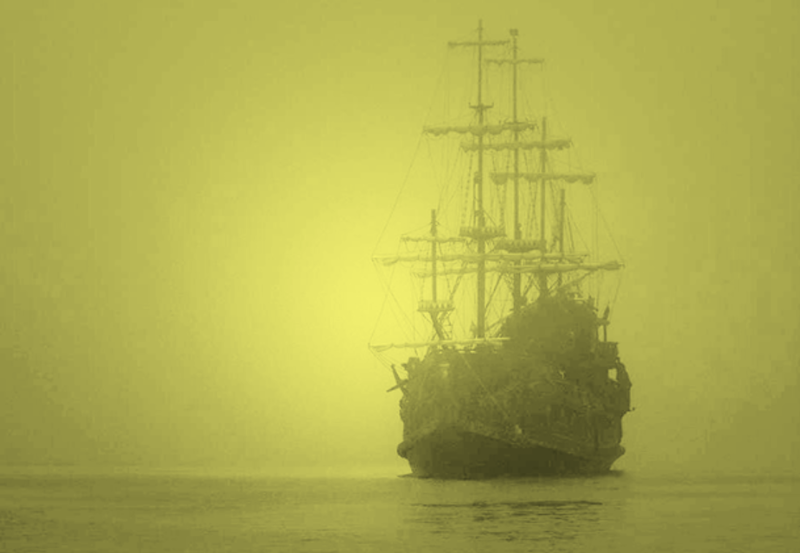 Lolo Amang's Golden Ghost Ship is the Philippine counterpart of the famous Flying Dutchman. Lolo Amang's ship frequently appears at night sailing the violent waters of the Romblon Triangle. A survivor of the M/V Don Juan sinking reported a sighting of Lolo Amang's ship before it collided with M/V Tacloban. The captain tried to avoid the ghost ship but ended up colliding with the oil tanker. It is said that he is docking his ship at a secret location. Allegedly the place is Barangay Cayatong in Looc or Ferrol town in Tablas Island. The Philippine Coast Guard frequently give warnings about the area not because of the appearance of the ship that would cause collisions, but because of the riptides that can cause big waves that could be dangerous for passing ships. The area is more dangerous using stormy weather. MV Princess of the Star capsized in the Romblon Triangle during the onslaught of Typhoon Frank. 437 people died when the ship capsized.